House Speaker John Boehner exaggerated when he said the 2.3 percent medical device excise tax in the Affordable Care Act “is costing us tens of thousands of jobs that are being shipped overseas.” It’s true that companies have announced the elimination of several thousand positions — worldwide, not just in the U.S. — but there is no evidence that the number has reached the “tens of thousands” or that all those jobs are going overseas. Medical device companies say the tax is only partially to blame for workforce reductions that have been announced so far, and investments overseas are being driven in large part by growth in “emerging markets,” such as China, India, Brazil and Russia. Costing U.S. ‘Tens of Thousands of Jobs’? The 2.3 percent medical device excise tax went into effect Jan. 1, 2013, so it has been in effect for less than a year. Since the IRS permits businesses to deduct “all excise taxes that are ordinary and necessary expenses” of a business, Moody’s Investors Service estimates that the net tax effect is about 1.5 percent — not the full 2.3 percent. The nonpartisan Joint Committee on Taxation says the tax is expected to raise about $29 billion in the first 10 years. The tax is imposed on clinical medical devices — such as CAT scan machines, stents, defibrillators and other devices sold to hospitals and other health care providers. It makes no difference if the device is manufactured abroad or in the U.S., since the tax is added to all sales in the U.S. The tax does not apply to consumer medical devices, which are those purchased directly by consumers — such as hearing aids, wheelchairs and contact lenses. Boehner addressed the impact of the tax in floor remarks on the eve of a government shutdown and a day after the House voted to amend the Senate budget resolution and repeal the medical device excise tax. 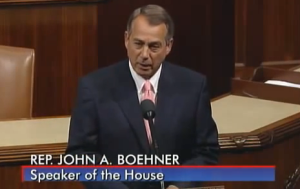 Boehner, Sept. 30: The House has done its work. We passed a bill Saturday night, sent it to the United States Senate, that would delay Obamacare for one year and would eliminate permanently the medical device tax that is costing us tens of thousands of jobs that are being shipped overseas. We asked Boehner’s office what evidence he has that U.S. medical device companies are shipping tens of thousands of jobs overseas, but we received no response. First, let’s take a look at the number of jobs that may have been affected so far. It may be that the law results in the loss of “tens of thousands of jobs” in the U.S., but there is no evidence that that is the case now — even from the tax’s most ardent critics. We contacted the Advanced Medical Technology Association, or AdvaMed, which is lobbying to repeal the tax. A spokeswoman from the industry trade group — which frequently cites the Furchtgott-Roth study warning of 43,000 job losses — told us it had no hard data on the impact of the law so far. We reviewed the clips sent to us by AdvaMed, and a list of companies affected by the law that was compiled by the Republican National Committee’s research team. The RNC posted its list Sept. 30 — the day that Boehner made his remarks. Even at face value, the two lists combined don’t add up to even 10,000 jobs, let alone “tens of thousands,” as Boehner said. The lists show that 12 large companies announced that they have or will eliminate at most a total of 8,725 positions — but not all of the jobs are in the U.S. and some positions are unfilled. Also, most of the companies did not blame the workforce reductions entirely on the tax, and, in a few cases, there was no mention of the tax as a reason at all for the layoffs. There are many factors at play that cause companies to restructure their operations — from consolidating operations after acquisitions to dealing with new market forces unleashed by a new federal law that puts increased emphasis on the delivery of more cost-effective treatments. One company on AdvaMed’s list denied the tax is the cause of either layoffs or moving operations overseas. Covidien announced in September of last year that it would close a South Carolina plant and move its operations to Costa Rica, resulting in 595 layoffs at the U.S. plant. Columnist George Will last year and, more recently, Sen. Kelly Ayotte on the Senate floor in March of this year blamed the tax. In another case, the announced job losses were more than offset by large job gains elsewhere in the company because of continued growth. But Stryker didn’t solely blame the tax for its restructuring plans and layoffs. And, nearly two years later, Stryker has actually increased its workforce — not reduced it — by 13 percent. When it announced the plans in November 2011, the company said: “The targeted reductions and other restructuring activities are being initiated to provide efficiencies and realign resources in advance of the new Medical Device Excise Tax scheduled to begin in 2013, as well as to allow for continued investment in strategic areas and drive growth despite the ongoing challenging economic environment and market slowdown in elective procedures.” It also said there would be a 5 percent reduction in its “global workforce,” not just in the U.S. So, the reductions were not all in the U.S., and there were other reasons for the decision, including freeing up capital for investments in growth areas. The new business strategy apparently is paying off. Stryker did not disclose in November 2011 where the layoffs would occur, and Johnson did not answer our question about the impact that the restructuring had on its U.S. workforce. It did close two plants in western New York that it had acquired from Gaymar Industries in 2010. According to Buffalo Business First, a business website, the plant closings resulted in 107 layoffs — which the company disclosed in notices filed with the state in compliance with the Worker Adjustment and Retraining Notification Act (WARN). But Stryker filed no such notices in its home state of Michigan, state officials told us in an email and phone call. It is true that some U.S.-based multinational companies, including Boston Scientific, are making major investments in foreign countries that will create jobs abroad, even as they announce workforce reductions in the U.S. The overseas investments are not a direct result of the tax, although there could be an indirect impact. As we mentioned earlier, the tax is imposed on all clinical medical devices sold in the U.S., whether those devices are manufactured in India or Indiana. Having said that, if a company sells more devices in India than the United States, then less of its revenues will be subject to the additional tax. As Moody’s explained, companies that will be the least affected are those with “relatively strong free cash flow” and “lower percentages of affected US revenues.” Conversely, those most affected would be those with weak cash flow and a higher percentages of U.S. sales. The incentive to increase sales abroad comes at a time when the industry is trying to capitalize on “emerging markets” known collectively as BRIC — that is, Brazil, Russia, India and China. So it is hard to separate the impact of the tax from the impact of natural market forces. So, the focus on expanding facilities abroad has to do in large part with business opportunities in these emerging foreign markets – not simply an effort to flee a new U.S. tax. Let’s look at Boston Scientific — which both AdvaMed and the RNC cite as an example of companies laying off workers because of the medical device excise tax. It’s true that the company has announced two waves of workforce reductions since 2011 as part of a restructuring of the company, according to the Associated Press story cited by the RNC. The AP says the company announced an elimination of 1,200 to 1,400 positions in 2011 and then an additional 900 to 1,000 positions in January of this year. That’s a total of, at most, 2,400 positions, the most of any company on the lists provided by AdvaMed and the RNC. AP said the reductions “will include layoffs as well as the elimination of unfilled positions,” and the company hadn’t decided where the reductions would occur. As of Dec. 31, 2012, the Massachusetts-based company had 14,000 U.S. and 10,000 international employees for a total of 24,000, and about half of its net sales were in foreign countries. Elsevier Business Intelligence, a trade website, published a June 2012 report called “Medical Device Growth in Emerging Markets: Lessons From Other Industries” that singled out Boston Scientific’s announced plans for China as an example of smart business practices. “Other players need to quickly follow suit to build their local commercial presence in a way that attracts and retains talent,” the report said.